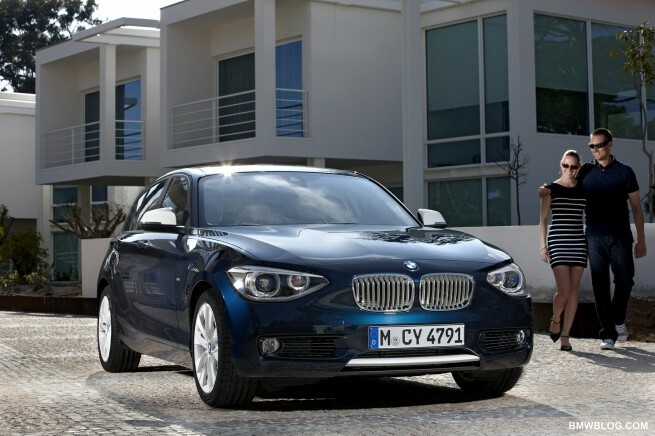 Disclaimer – What we are seeing is the meat and potatoes version of the new 2012 BMW 1 Series, the five series hatch. We haven’t seen the more sporting 3 door, nor the eventual coupe and cabrio models. In addition there is only a subset of powertrain options represented here. No sixes, no 2.0L gas engine, and not the 123d range topping diesel. It took four years (2004 – 2008) to bring the coupe and convertible E8x 1ers to market, and while I suspect that that timeframe will be compressed, I wouldn’t expect the coupe and convertible of the F2x 1er to be in the US market before 2013.
there are plans to introduce a 116d EfficientDynamics Edition which should return combined fuel economy numbers of 3.8L per 100 km (and for European market concerns under 100 grams of CO2 per kilometre – I think that may be under my lungs production of CO2 per km at a jog). Look for additional coverage and analysis of the F20 1er on BMWBLOG.